You can view all transactions made between your store account and StoreHippo like subscriptions, SMS charges, shippo charges, etc in Transactions section. You can filter the transactions on the basis of service against which it was credited or debited and may also export the data for your reference. Go to Plans and Billings > Transactions section in StoreHippo Admin Panel. In the all transaction tab, all the transactions are present with the complete list of credit and debit entries for all the actions performed by the admin. In the Credit tab, only the credit transactions are listed. In the Debit tab, only the debit transactions are listed. The account balance is the total balance of the store. 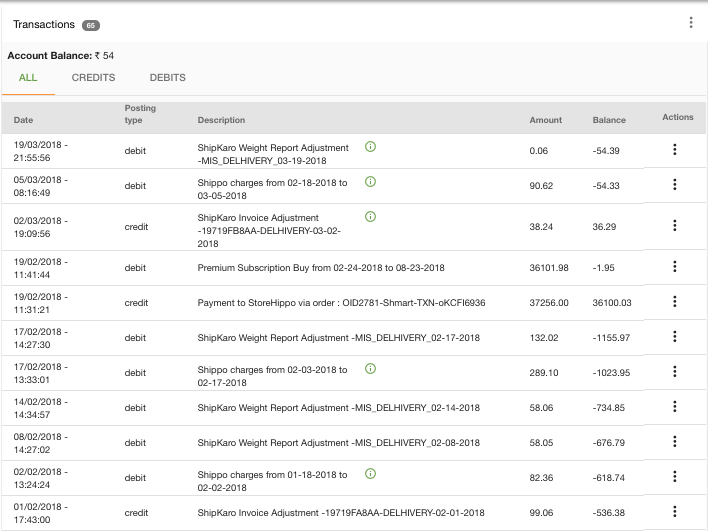 You can view the details of the Shippo charges, invoice adjustment and canceled shipments by clicking on the info icon. The details include reference id, posting type and amount of the canceled transaction.